Riley Sullivan and Yael Goldstein opened their Mediterranean-style restaurant in downtown Gainesville on St. Patrick’s Day 2015. A year later, they are a married couple and couldn’t be happier. It’s St. Patrick’s Day. For a chef named Riley Sullivan, you’d think that would mean preparing the traditional corned beef and cabbage or perhaps fixing up an Irish stew over a hot stove. You know, Erin go Bragh and all that stuff. 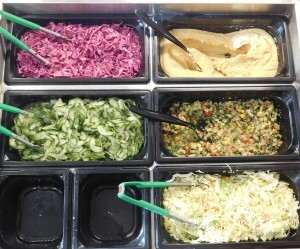 Sababa’s salads, hummus and tabouli. Sullivan has Irish roots, for sure. However, on this holiday honoring the patron saint of Ireland, you’ll find him laboring over such savory Mediterranean dishes as shawarma, falafel and bourekas. The Gainesville native is not turning his back on his Irish heritage. 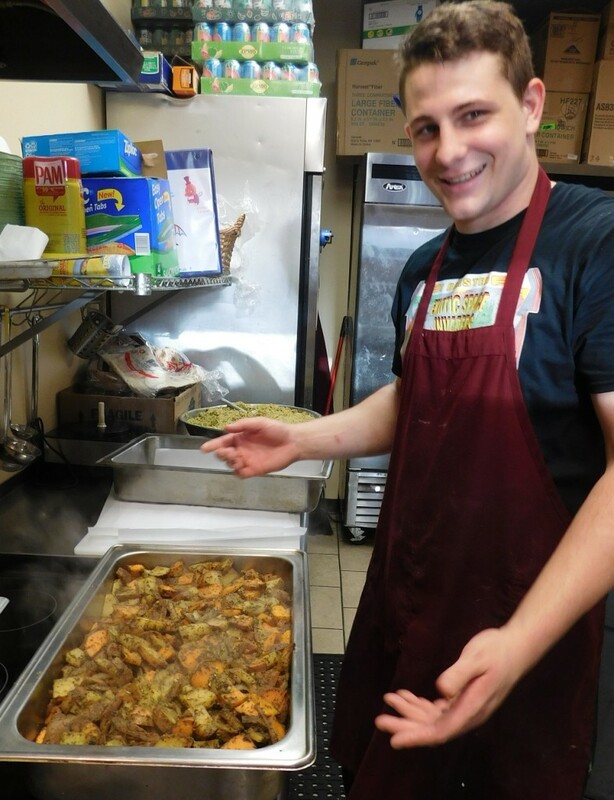 He’s simply pursuing the proverbial pot of gold at the end of the rainbow in the form of Sababa Israeli Cuisine at 101 SE 2nd Place, next door to the Hippodrome. “It’s been incredibly satisfying,” Sullivan said while pulling a pan of roasted potatoes from the oven. Coincidently, March 17 happens to be Sababa’s one-year anniversary at its Sun Center location. For Sullivan, 25, and his 24-year-old wife, Yael Goldstein, the past year has been more rewarding than they had ever imagined. No worries. Today, people head downtown specifically to order off Sababa’s glatt kosher menu that includes a selection of vegan, vegetarian and gluten-free dishes. In fact, the restaurant uses no dairy products. The menu board at Sababa. Customers can’t seem to get enough of the starters, side dishes, entrees, pita sandwiches and desserts with a distinctive Mediterranean flavor. 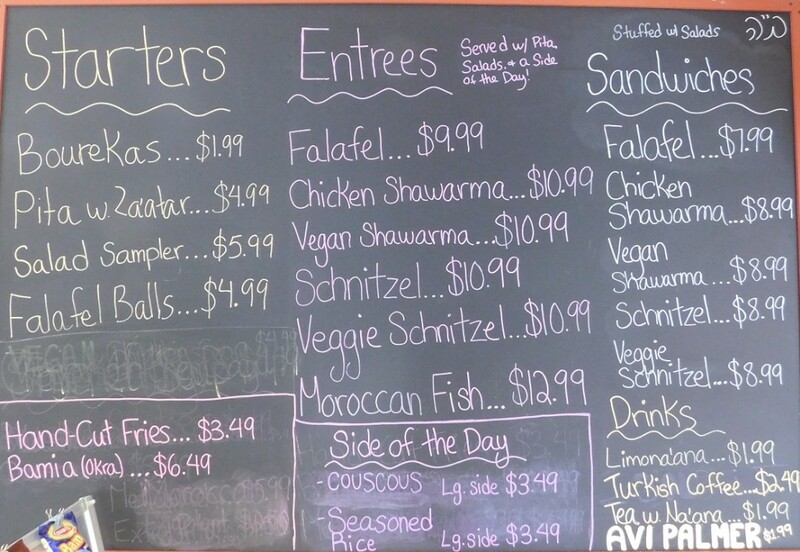 The most popular items include chicken and veggie schnitzel, chicken and vegan shawarma, falafel and Moroccan fish, which is salmon baked in tomato sauce with peppers and onions and topped with cilantro. Conventional wisdom would dictate that Goldstein, whose mother is Israeli and a terrific cook, is in charge of the recipes at Sababa. Nope! Riley Sullivan and a steaming hot pan of roasted potatoes fresh out of the oven. Sullivan has no formal culinary training, but he learned how to cook from the best—his wife’s mother, Liora Volkovich. “She loves him!” Goldstein explained. Several years ago, before the couple was married, Sullivan began looking over Volkovich’s shoulder as she prepared dishes she grew up with. There wasn’t a recipe card in sight. “My mom refuses to write down recipes. Everything is by taste,” Goldstein said. Sullivan asked questions and made plenty of mental notes. He later wrote down many of the recipes for consistency. Yael Goldstein fills a customer’s order at Sababa. Last year, for the first time, Sullivan insisted on preparing the family’s Passover (Pesach) seder at their newly opened restaurant. With everything at his disposal, Sullivan took less than four hours to prepare the ritual that fed about 25 people. The story of Sababa goes further back than one year. Volkovich started the restaurant several years ago at the old Gainesville Dojo building, off Southwest 2nd Avenue. 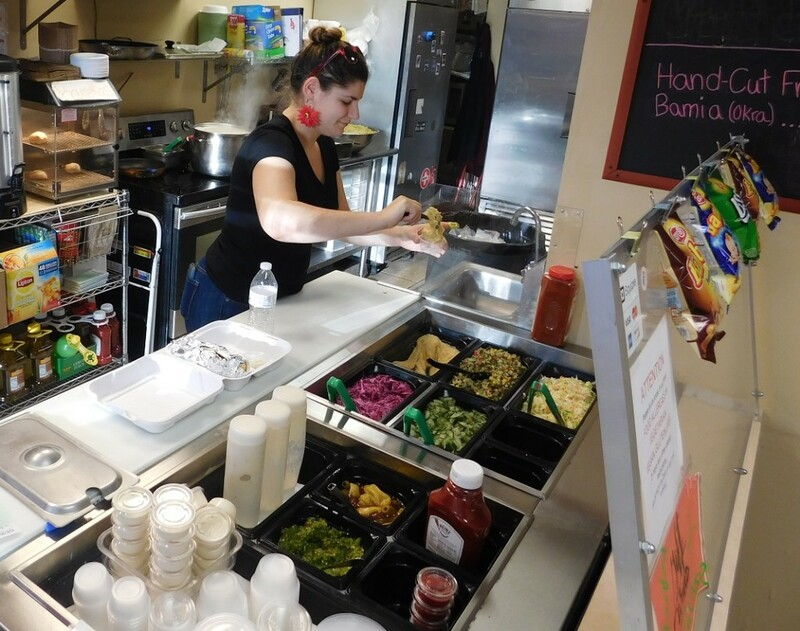 She soon moved the eatery into a second-floor space at the UF Hillel Center on West University Avenue, near the football stadium. Before long, Goldstein and Sullivan were running the place but found it challenging to make food “on the spot.” When the lease expired, they looked to move the restaurant elsewhere in Gainesville. “This place” is a former dance studio on the first floor of Sun Center East, overlooking the outdoor courtyard but also with an entrance from the indoor atrium. Customers order their food at the counter next to the kitchen. Although many orders are to-go, Sababa has a spacious dining room with wooden tables made by the couple. The walls are lined with photos and artwork that give the place a Mediterranean look and feel. Goldstein grew up in suburban Philadelphia. She tried to model Sababa after her favorite restaurant there. “I was trying to copy the Israel feel as much as possible,” Goldstein said. “Yael and I designed and built everything exactly the way we wanted to, and it’s been very rewarding,” Sullivan added. Goldstein and her family moved to Gainesville when she was 17. She had attended an Orthodox private school her entire childhood but enrolled at Gainesville High School for her senior year. Sullivan also attended GHS, but the two didn’t share a class until their freshman year at Santa Fe College. They started talking and realized they lived down the street from each other. Soon they started dating, and Goldstein’s opinion of Sullivan magically changed. They were together five years before getting married last September in a double ceremony with Goldstein’s sister and her fiancé. Sullivan has worked in restaurants–11 in all–most of his young life. Next week, on March 24, Sababa will celebrate Purim. The joyous holiday commemorates the saving of the Jewish people from Haman, who was planning to kill all Jews in the ancient Persian Empire. Holiday customs include costume parties and eating triangular-shaped cookies known as hamantashen. At Sababa, there are already masks on the wall as a reminder of Purim. Goldstein referred to Purim as the Jewish version of Halloween. Sababa will offer a 25-percent discount to customers in costume that day. 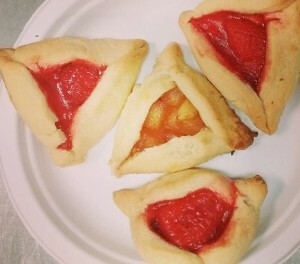 Sullivan has started baking test batches of apple- and strawberry-filled hamantashen for the occasion. 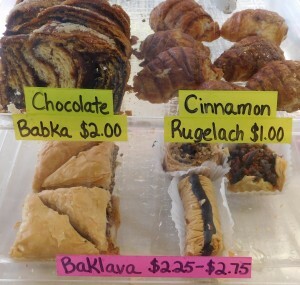 Sababa already offers tasty desserts, including rugelach, babka, baklava and bamba, as well as Osem brand snacks and Elite chocolate bars imported from Israel. 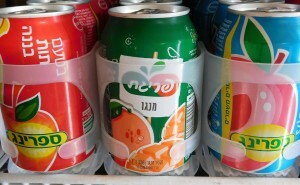 There is also a line of Prigat nectars made in Israel. Another favorite is Limona’ana and iced tea na’ana infused with mint. A combination of those two drinks is called the Avi Palmer in tribute to Goldstein’s father, Arnold. Soon, with a liquor license, Sababa will offer wine and beer, including Gold Star brewed in Israel. Customers who eat at Sababa can’t help but notice the youthful enthusiasm shared by the young couple behind the counter. The first year of Sababa at Sun Center now behind them, Sullivan and Goldstein can’t wait to see what is in store for the restaurant in its second year and beyond. Hours: Tuesday through Saturday, 11 a.m.-9 p.m.
For further info, visit Sababa on Facebook.